The idea that Roman soldiers went everywhere dressed simply in tunic and boots (in addition to their personal equipment) is patently false, yet most Roman re-enactment societies, including our own, propagate this false idea to the public by displaying in the expected tunic and boots clothing option whatever the weather. An inescapable fact however, is that the Roman army was a body (or a number of bodies) of seasoned professional men, who would not only have been used to tough conditions and been acclimatised to them, but would also have been sensible enough to know that dressing for the weather can be the difference between sickness and health. The phrase any fool can be cold was probably no less true then than it is now. What clothing was available then? The one item of cold weather clothing which most of us already own is a cloak and for the Romans (like everybody else) cloaks were probably the most obvious protection from the cold available. Two sorts of cloaks seem to have been common amongst the general soldiery, namely the paenula and the sagum. These (especially saga) could be very big and heavy (and consequently warm) and in the case of the paenula, could feature hoods. In addition to this, there are literary references to undercloaks (subpaenulae) and at least one of the Rhineland stelae seems to show something which looks like shoulder doubling on the inside of the cloak. It is also relevant to state that if the cloaks were not subjected to modern dying processes they would retain much of the natural lanolin in the wool, which would make them fairly water resistant. Cloaks however, are not practical to wear all the time so they represent only one of a number of types of cold weather protection. Despite their apparent rarity in the sculptural record, we know that socks (udones) were fairly common. As most people reading this will already know, socks are in fact mentioned in one of the Vindolanda letters (which also tells us that soldiers could also receive clothing as gifts from their families) and are probably shown on the Cancalleria reliefs. Socks could be made in two ways, either by being cut from fabric and stitched together or by being made by the sprang work method, which is reasonably similar to crocheting. Examples of both types have survived, with the cloth type surviving not only from Vindolanda but also from a series of waterlogged graves in Gaul, and the sprang work type is known from examples which have survived in Egypt (the Egyptian examples were brightly striped and were designed with a separate toe to accommodate thong type sandals). The possible socks shown on the Cancalleria reliefs lack toes and heels and could have been made from a cloth or sprang work tube with a horizontal slit halfway down which would open around the heel when the sock was put on. Next, but just as significantly, a favourite Roman method of keeping out the cold was to wear more than one tunic at a time. The emperor Augustus supposedly routinely wore no less than four tunics at a time (in addition to his toga presumably). Soldiers would certainly have done this. It would not be outside the realms of possibility that a Roman soldier might have purchased a locally made long sleeved tunic and worn it under his Roman type tunic (or tunics). Next we come to the scarf (focale). As anyone who lives in a cold climate knows, scarves are very good at keeping you warm. The few known Roman depictions of scarves show them to be shaped very like modern scarves (sometimes even with tasselled ends). Graham Sumner also suggests that the small triangular scarves used by many re-enactors may not be correct and suggests that scarves may in fact have been straight and quite large. Depending on how it is worn, the ends of a scarf can also provide extra insulation to the chest area. The next thing to consider is hats. We know that the Romans had access to hats for sunny weather and it stands to reason that, given the fact that heat is lost from the head faster than any other part of the body, they would probably have worn hats in cold weather. In addition to the hoods of their cloaks, it has been suggested that soldiers may have worn their helmet linings as hats, but as some linings appear to have been glued into their helmets, this cannot have been the case all the time, if it was at all. It is possible the hats worn in winter may have resembled the brimmed hats worn in sunny weather. It is even possible that these hats were one and the same. Depictions of travellers on Greek vases often show them wearing high boots (or shoes and lower leg coverings) and virtually always show them wearing a hat and cloak. Given that this clothing seems designed for use in colder weather (there being no doorways for the traveller to hide in when the rain came down), it seems likely that the brimmed hats shown were not straw hats but felt or perhaps leather hats, which would keep out cold and rain better. By contrast, some Italian pottery statuettes of the same period show people wearing yellow brimmed hats which are almost certainly supposed to represent straw. It is possible that a straw hat could be worn in hot weather but a felt or leather version of the same thing worn in cold weather (this could also help explain the writer Vegetius statement that soldiers in earlier times had worn heavy leather hats). Brimmed hats like those worn by agricultural workers in some mosaics and statuettes are normally assumed to be straw but could just as easily have been made from warmer and more waterproof materials such as felt and leather. Hats may not have been issued to soldiers but even then they would probably have been easy of make or purchase. Finally, we come to trousers. Trousers seem an obvious solution to us, and obviously they must have seemed obvious to soldiers of Celtic or Germanic origin, but that thinking may not have applied to the Roman mindset, which tended to think of trousers as the mark of the barbarian (a term which included Persians, along with the other barbarians we would normally think of). This is not to say that the common soldier necessarily shared all of the views of his social superiors and there must have been occasions when soldiers on campaign supplemented their existing clothing with locally obtained trousers, but many, if not most of them, may have felt little need to do this. They already had tried and trusted cold weather clothing in the form of hooded cloaks and lower leg coverings, and (probably) felt and/or leather hats. It is also worth remembering that not all cultures immediately take on the idea of trousers, the Scots being an obvious example. Whatever the actual origins of the kilt, it is worth noting that thousands of Scottish soldiers went through the First World War and a slightly lesser number during the Second World War wearing kilts and heavy knee length socks. Obviously this was an issued uniform, but there are enough surviving photographs of Scottish soldiers in muddy, waterlogged trenches to show that they really did wear the kilt under campaign conditions (albeit often supplemented with Wellington boots). Trousers are not necessarily essential to keeping warm in the cold! We know of course, that Roman legionaries did eventually wear trousers, but the earliest evidence for this dates to the period of the Dacian wars, several decades after the period which our equipment would be typical for and we thus represent. As a conclusion then, the Roman soldier faced with cold weather and sensible enough to dress appropriately had a number of clothing options which he could wear singly or in conjunction with each other. Thus he had at his disposal socks, lower leg coverings, extra tunics, a scarf, a cloak and probably a rainproof hat, whilst the barbarian elements of the army would also naturally gravitate to trousers as an option. 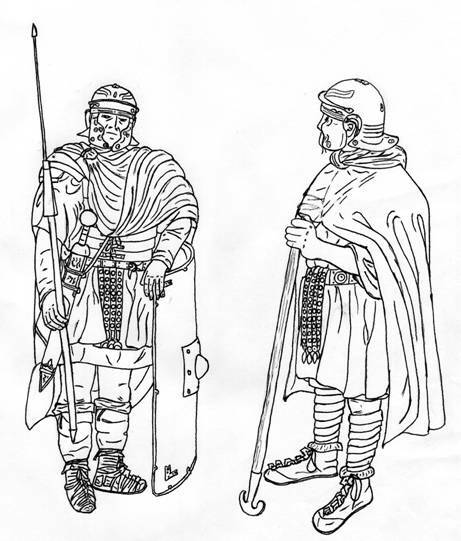 In the illustration below, the soldier on the left has supplemented his basic clothing with socks, leg wrappings, a locally obtained long sleeved tunic worn under his normal tunic and a sagum. The soldier on the right has opted for enclosed boots, socks, leg bindings, an extra tunic and a paenula. Lastly, thanks to Iustus and Abdas who unwittingly stood in as models for the reconstruction drawings.